A rash of injuries certainly hasn't helped the struggling Detroit Red Wings as they cling to their narrowing Western Conference lead. Help will start to arrive Friday, though, when newly acquired defenseman Brad Stuart and injured goalie Dominik Hasek should be available against the San Jose Sharks, who arrive in Detroit with the NHL's best road record. Detroit's slide has been stunning, as the Red Wings (42-17-6) have lost three in a row and nine of 10. Once 17 points up on the rest of the league, the Wings have seen their advantage cut to single digits by surging Dallas. A decimated defense corps is a big reason for the slump. The Wings have been playing without injured defenseman Nicklas Lidstrom, Chris Chelios, Brian Rafalski and Niklas Kronwall, though Kronwall could return Friday after missing 13 games with a clavicle injury. Seeking reinforcements, Detroit dealt for Stuart at the trade deadline Tuesday, and he practiced with the team Thursday. Hasek was in uniform for Wednesday's 4-3 shootout loss at Edmonton, and could start Friday. His absence sorely hurt the Red Wings, as the veteran hasn't played since Feb. 9, and replacement Chris Osgood went 1-4-1 with a 2.98 goals-against average while Hasek was out. The injury bug has also hindered Detroit offensively. Tuesday's loss to the Oilers was just the second time in the last nine games the Red Wings scored more than two goals. They outshot Edmonton 43-29, but allowed the tying goal in the final minute of regulation and failed to convert any shootout attempts. "We had so many opportunities it wasn't even funny," coach Mike Babcock said. "It's been tough lately, and tonight was no different." Henrik Zetterberg, who leads the Red Wings with 35 goals, has been held without a point for three straight games. Three of Detroit's top five scorers in Lidstrom, Rafalski and right wing Daniel Cleary - out with a broken jaw - are injured. Each player has at least 40 points. Detroit, which completed a five-game road trip, has lost three straight at home after starting 21-4-2 at Joe Louis Arena. The Sharks (34-21-8) are a league-best 20-8-3 away from home, and have won their last three games to improve to 3-3 on a season-high eight-game trip. They had lost five straight prior to their current run, but are in fifth place in the West. They won 4-2 at Columbus on Wednesday, holding the Blue Jackets to 19 shots on goal. "As a team, we played really solid defensively," veteran forward Jeremy Roenick said. "Our power play was really good. The third period we went at them, we didn't sit back, which we have done in the past." Defenseman Brian Campbell earned an assist in his debut with San Jose. Campbell, acquired in a trade with Buffalo on Tuesday, joins a defense that has allowed 21 shots or fewer in seven of the last nine games. "He showed that he's a player, that he wants to be on the ice all the time. 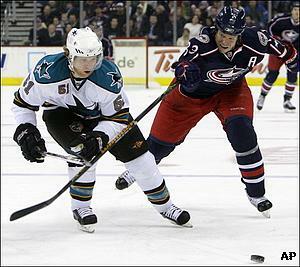 He's generally always in attack mode," Sharks coach Ron Wilson said of Campbell. "You can see he's a sneaky hitter, too. He moves pucks really well. You can see his speed. I think he will really help our power play, obviously." San Jose, which had managed one power-play goal over the previous six games, scored two against the Blue Jackets. One came from forward Jonathan Cheechoo, who has a goal in each of the last four games. Cheechoo has just 19 goals in 2007-08 after scoring a combined 93 over the previous two seasons, but he's recorded eight goals in the last nine games. The Sharks' suffocating defense hasn't shown up against the Red Wings recently. Detroit has scored 15 goals in three wins over the Sharks this season, and San Jose goalie Evgeni Nabokov has lost seven straight regular season decisions to Detroit, compiling a 4.72 GAA over that span. The Wings have won six in a row overall against the Sharks, including the final three in the teams' Western Conference semifinal series last season.